Towers Street is your colourful portal into the wonderful world of Alton Towers. From the head of the street, where the Corkscrew monument stands proudly over the entrance plaza, you enter the park with a view out over the ruins of Towers, which are framed grandly by the buildings of Towers Street. Along with retail outlets and admission facilities, Towers Street is also the transportation centre of the park, with the Monorail station in the Entrance Plaza and Skyride station at the foot of the street. 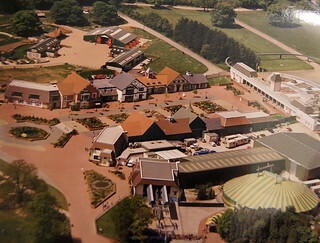 The layout of Alton Towers means that the park essentially unfolds from Towers Street, so from the entrance it is easy to move between the different areas of the park and navigate the many acres. Towers Street also acts as one of the entertainment hubs of the park and it is not unusual to be greeted by a variety of entertainers first thing in the morning or waved off at the end of the day. 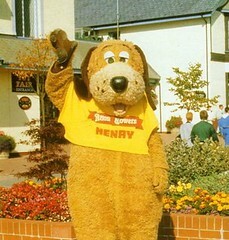 During the 1980s Alton Towers was going through some major transformations. The park was beginning to evolve from a "funfair in the woods" to the theme park we all know and love today. But what theme park is complete without a suitable entrance? 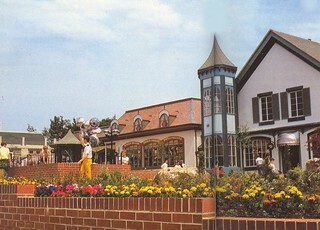 For 1986 Alton Towers aimed to create just that. Towers Street was conceived as an expansion of the Grand Entrance which had opened the previous season, with the aim to create a Victorian style shopping centre at the heart of the park which made use of the exceptional beauty of the views across the lake. The design of the new entrance leant on the popular theme park design concept of having a street scene leading towards a magnificent structure at the centre of the park. At the time Disney was considered to be the only company to truly master this style with their 'hub and spoke' concept, and Alton were not alone in using them for inspiration during the 80s. The Monorail was supposed to open along with the rest of Towers Street the previous year, but complications in shipping parts delayed its opening. The entrance plaza was designed with the Monorail in mind however, allowing it to fit into the area seamlessly when it was finally built. 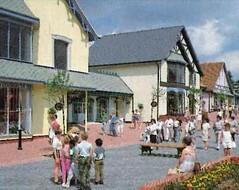 During the 80s, the shopping experience was a core part of a day out at Alton Towers and Towers Street originally had shops lining both sides of the main path, selling everything from cuddly toys to pieces of furniture. In the centre were several brick flower beds, surrounded by benches, Victorian style street lighting, signposts, and the iconic leap-frog fountains. When first installed each fountain jet resided in their own brick ponds, allowing guests to dive under the jets and interact with the streams of water. 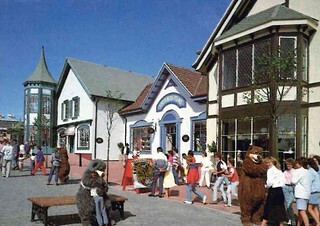 When Tussauds Group took over the park in the 90s, they took a different approach to managing the park, including a belief that shopping was less important. This led to all the shops down the right hand side of the street closing in 1992, with false displays appearing in the windows. Behind the scenes the entire stretch was renovated into offices for park management. Shortly afterwards the shops running down the left hand side were also combined and turned into the larger Towers Trading, which is still with us today. Having completed their overhaul of the facilities on offer at Towers Street Tussauds continued to redesign the rest of the street, removing the original brick flower beds and replacing them with the more natural looking grassy islands and boulders we see today. 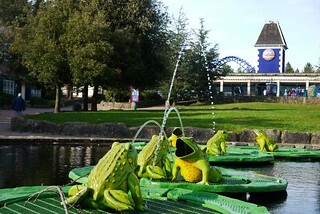 During this remodelling the leap-frog fountains were also combined into one larger pond, and redesigned to become the iconic frogs on lily pads. Having completed their renovation the area was once again left in peace, though some consider this being the point at which Towers Street lost a lot of its original charm and vibe. In 2007 when one of the old shop fronts was reworked to become home to YourDay, a project which allowed guests to purchase video footage of themselves on many of the larger Alton Towers rides. However, this venture was short lived, with YourDay entering administration in early 2009. The project continued through 2010 under the name Alton Towers Resort DVD, before ceasing operation entirely in early 2011. 2010 saw a new addition to the top entrance plaza of Towers Street. In preparation for Secret Weapon 6 (Th13teen) Alton Towers had removed their iconic Corkscrew coaster. 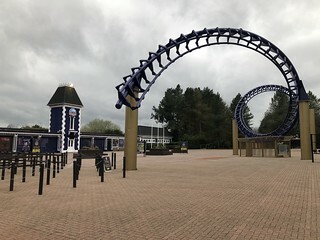 As a tribute to the ride, which put Alton Towers on the theme park map, the looping corkscrew element was saved from going to the scrap heap and returned in 2010 in a new purple and gold colour scheme. They were re-installed in the Entrance Plaza with a historical marker placed alongside to pay homage to this major part of the park's history. As part of the installation the tower over the turnstiles was also repainted from its former red to purple. In May 2011 the old YourDay outlet reopened as the Resort Box Office, the new main Sale and Information centre for the park, where guests could purchase upgrades for their visit or Annual Passes. In 2015 Guest Services closed at the top of the street and its remaining functions were also moved to the Resort Box Office. As part of the Alton TLC programme, Towers Street got a colourful makeover, starting with the makeover of the Photo Collection Point in 2016 and completing with the Monorail station during the 2018/19 closed season. Towers Loving Care also saw a remodel of the Entrance Plaza, which saw the 1980s photo booths demolished and replaced by planters, as well as the introduction of the "Make Your Mark on the Park" paving, where guests could personalise a brick in the floor of the plaza. Today all of your shopping needs on Towers Street are handled by Towers Trading Co. but back when Towers Street first opened both sides of the streets were lined with an array of different shopping options. Alton Towers has always been at the forefront of fashion and Leisure Boutique was a dedicated clothing store, which combined high street brands with Alton Towers own clothing lines. Leisure Boutique is now the central portion of Towers Trading. 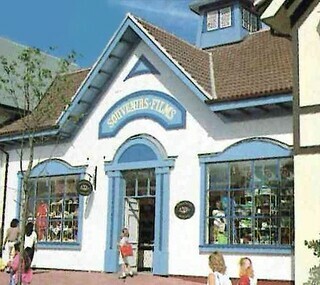 Something Special was the original souvenir shop on Towers Street, selling a wide range of Alton Towers merchandise. It also housed the Film Shop, which offered guests free camera hire. The unit that once house Something Special is now the main entrance for Towers Trading. A child's dream come true, Toy Fair was stacked wall to wall with all manor of Toys and Games, from big brands like LEGO through to every conceivable type of Henry Hound merchandise. It is hard to believe that once upon a time you could leave Alton Towers with a piece of furniture as a souvenir, but World Bazaar would let you do just that. Stocked with curios from around the world, the bazaar offered visitors the chance to take home a truly unique memento of their day. 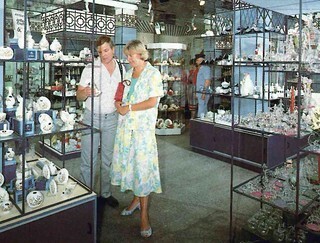 The unique offering of World Bazaar was an early casualty of the Tussauds era and was soon swapped for a more generic souvenir store, First and Last. Today the area is the checkout for Towers Trading. The Bond Street Boutique was Towers Street premiere shopping location in the 80s, selling designer brands such as Cartier, Gucci and Yves St Laurent. After Tussauds took over the park the Boutique was replaced by a shop called Options and today the building is home to the Resort Box Office. One of the original Towers Street attractions, this shop offered a huge range of homewares and decorative items. The shop also had an in-house glass blower, who would produce more personalised souvenirs. The Glass and Ceramic studio was located in a building half way down Towers Street, which is now offices and is painted blue and pink.